Tiger Salamanders have a granular ("poison") gland concentrated on the upper surface of the tail, and they can raise and lash their tails if prodded or otherwise threatened. This may discourage some predators. However, many specimen fail to display any defensive behavior when exposed, except for trying to walk away or wriggle out of a restraining hand. 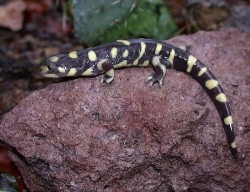 Tiger Salamander sense the presence of predators and food through its sensory system. 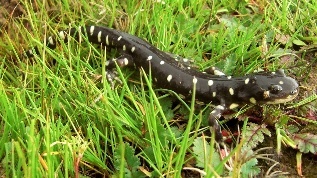 The tiger salamander has a small, compact brain. It has two cerebral hemispheres comprising its forebrain, which converge into a midbrain, then converge into a hindbrain from which the cerebellum and spinal cord extend. Axons from receptors in the nose project onto the anterior third of the surface of the two hemispheres, where the olfactory bulb, part of the cerebral cortex, is located; thus, there is a direct pathway that receptors, with their cilia extending into the outside world, form by sending their axons directly into the cerebral cortex. The lateral third of the hemispheres contains the pyriform cortex, essentially a motor cortex with projections going down into the brain stem with relays into the spinal cord. The medial third is a well-developed laminated neuropil that we call the primordial hippocampus. Located between these three areas, is a transitional cortex that receives input by way of the thalamus from all sensory systems except the olfactory (whose input goes directly to cortex in the manner described above). Visual, auditory, somatosensory, gustatory, and olfactory input converges in the cerebral cortex.